In 1974 Justice Thomas Berger came north to conduct hearings into the social, environmental and economic impact that the construction of a pipeline would have on all the people of the Mackenzie valley (map), Dene, Métis, Inuvialuit and non-Aboriginal. Some of North America’s largest oil companies were seeking government permission to build a pipeline from the western Arctic up the Mackenzie valley and into Alberta. Justice Berger could have held hearings into the proposed pipeline in southern boardrooms but instead went directly to the people who would be affected most by the construction of this pipeline. The message Berger received was loud and clear, no pipeline until land claims were settled! 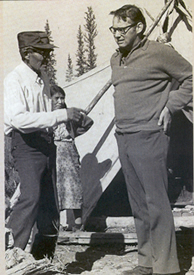 The Berger Report, which recommended a ten year moratorium on the construction of a pipeline, “shaped the political, social and economic progress of the Northwest Territories ever since”. Today the people of the Northwest Territories are once again being asked to consider the construction of a Mackenzie valley pipeline. The Mackenzie Gas Project – four major Canadian oil and gas companies and a group representing Aboriginal people – is asking permission to develop natural gas fields in the Mackenzie Delta and deliver, to southern markets, natural gas from these fields by 2010.